Review originally published at BookThing!Once I finished Exogene, and then had time to think about it, I spent an hour ranting at my husband about the unjust and detestable treatment of the Germline warriors. I wanted to know how the military or government could treat human beings like machines, even ones that have been genetically engineered. I wanted him to tell me what possible justification there could be for the abuse, the deplorable behaviour, and how they couldn’t see what I could see; that the Germline warriors were real human beings, with real emotions. But this wasn’t on the news. This wasn’t in the tabloids or broadsheets. It’s fiction presented with such brilliant character insight, such incredible realism that I felt truly angry at the injustice it represented.It’s rare a book that causes such a visceral response in me, but with Exogene, T.C. McCarthy gets it just right. The story is stark, harrowing and grim but brilliant in its execution. He doesn’t waste words or go into lengthy descriptions, but still says everything he needs to with compact, emotional sentences. He gets the pace spot on, both time and huge distances being covered in a few pages, and yet you feel as if you have lived every one of those steps yourself.The story is told through the eyes of Catherine, a first generation Germline soldier and being in her head was both tragic and fascinating. There are so many elements to her character, experiencing her indoctrination, watching her sisters embrace their faith or go insane, the decisions she makes rather than just following orders, her only understanding of the world is the one that her creator’s have given to her. As she travels and discovers her own truths, my heart ached for her more and more. Every loss, her constant weariness and even her madness resonated with me. McCarthy has written an utterly believable and realistic female character. Her determination to keep going, to overcome each obstacle and to choose her own path make her a character to be remembered.Like Germline, I read Exogene in a single day, unable to stop until I had turned the very last page. Then I had to think about it for a while, let the experience wash over me and sort out how I actually felt and how much I had been affected. The story is told in a mixture of present tense, flashbacks and hallucinations and while that might sound confusing, it does work well.There weren’t as many background characters in this book but we get numerous glimpses of Catherine’s ‘sisters’, both first and second generation. Megan was especially interesting and it was a shock how, almost casually, things changed for her. Margaret was a more tragic figure, different, but just as engaging, I hope we will see her again. As with the first book, the ending of Exogene did surprise me, but for different reasons. The letter at the end caused a huge emotional response in me and I was left a bit speechless.Exogene is a heartbreaking, brutal look at near-future warfare that is so far outside my comfort zone it may as well be another dimension. Thankfully, McCarthy manages to ground the story with realistic characters, and delivers a book which challenges and entertains in equal measure.I truly cannot wait for the third book in this series, to see where T.C. McCarthy will be taking us next. Perhaps not the OMFG 5-star rating of Germline, but 5 stars nonetheless.Exogene is primarily the story of Catherine, a soldier created by American scientists to tip the scales of the subterrene war in its favor. Catherine was bred a killing machine in an eighteen year old girl's body. An integral part of the design of these soldiers is their indoctrination with religion. They were activated with faith consisting of the belief that killing the enemy is the essence and purpose of their existence, at the end of which they shall be with god. Religion, when used as a means to an end, can be a dangerous, double-edged sword.Catherine was a technological success, killing with impunity and efficiency. But she is a dynamic and constantly evolving thing. When artificial sentient beings are fashioned after humans, is it not bound to mimic its model and even develop its faults, commit the same mistakes? As a machine, logic dictates much of Catherine's actions. Logic often has naught to do with right or wrong, only efficacy, efficiency and rationality. Man can be an optimal machine when need be albeit not indefinitely. But man also notoriously needs to know the how and the why and the what for. Both man and machine however, when pushed far enough, eventually hit a threshold -- the point where it becomes incapable or unwilling to proceed. Catherine will face the threshold and struggle with her views on her existence, humans, the enemy and an honorable end.Exogene is slower paced than Germline, more introspective, clinical even. While many skirmishes are described, much of it is a stream of consciousness or window-into-the-mind-of-Catherine approach. I wouldn't be surprised if this was by design though. It certainly fits the nature of the protagonist in this tale -- an artificial being imbued with human attributes. It explains Catherine's halting vacillation. I can imagine the difficulty of being brought into consciousness in an almost-adult body without the concomittant life experiences that come with age. The dispassionate calculation required by her programming stands is stark conflict with the human thoughts and feelings that increasingly crept in with every incursion. Throw in religion with all the doubt and uncertainty inherent in it and it's certainly a powder keg in a single being largely unprepared and ill-equipped for it.I found Exogene well-entrenched in the story of The Subterrene War. I understand the criticisms about it being slower or Catherine being less sympathetic. I thought it was an appropriate fork to take in the telling of the tale. I don't require breathtaking action all the time nor do I need to relate to a character to appreciate her depth. But what Exogene does best is plant an even more indellible imprint of that world in your head, your heart and all your senses. You can almost smell and feel and hear the war zone. T.C. McCarthy gives China Mieville a run for his money in this department (Perdido Street Station has the most palpable setting I've read). It also gives a better map of the geopolitical terrain. It paints an even bleaker picture and has a more fatalistic feel.Germline was a gut-wrenching opener to the trilogy. It wreaks havoc with a reader's emotions. Exogene is a more thoughtful treatise, presented in the voice of a germline unit and providing an extensive look into the war landscape. I am definitely eager to read the conclusion. I need to read something in between though for a bit of a break in the melancholy. I suspect I will need to brace myself for what lies in the pages of Chimera. This combination of the ideas in Bladerunner, military fiction and genetic engineering science fiction book is a fast paced look at a future war in which many of the combatants are genetically created humans. McCarthy's main characters are Catherine, Megan and Margaret.Catherine and Megan are genetics decanted from the Atelier at 15 as soldiers in a global war. As part of the training, the genetics receive a constant indoctrination about God, Faith and killing. They are trained to not be squeamish at all and its part of this indoctrination that they believe that if they die they just meet God. So the young girls all believe that killing is good because they just meet God that much faster, and they have an amoral attitude about killing and life in general. They are armed with a perfect killing gun, a carbine that shoots small flechettes, hundreds in a clip.Mostly they fight in Russia against Russian soldiers and genetics to find energy in Russia. Megan is a Lily, the leader of a group of genetics. There is a small computer embedded in her brain that helps her with her mission. Catherine is her right hand killer. A lethal killer. Like Bladerunner, the genetics have a kind of programmed shelf life. If they are not killed in combat, their bodies and minds go through a spoiling process -- their minds go through hallucinations while their bodies start to rot and get affected by gangrene, and they are hunted by humans who seek to kill them.The novel is told in a series of flashbacks to the early days in combat and then jump aheads to the present. Catherine and Megan are primo genetics. They have survived everything the horrendous war has thrown at them. Catherine especially is a ferocious killer, who has earned the sobriquet -- the Little Murderer.Also Catherine has had some genetic modified chemicals used on her to see if the scientists can learn why she is so lethal at her job.Catherine has started to lose her mind to hallucinations and takes massive amounts of trank pills just to hold it together.Neither Megan nor Catherine want to die from the spoiling or the Americans so they choose to run and try to escape to Thailand where supposedly other escapees are living.At some point Cahterine gets help from Russian scientists who help her stop the gangrene, attach prosthetics to her limbs and make her work in a factory with second generation female genetics. But it appears that Catherine is still wanted by others or that the Russians may want to turn her into a machine man mold, so she and a fellow prisoner, Margaret, try to escape from Russia and begin a run across Russia, through China and Korea. Betrayed constantly, Catherine must battle through her deteriorating mind and all of the humans who want to sell her or Margaret or both, until she can figure out how to live on her own. Still a lethal warrior, but more and more reluctant to kill unless she has too or because the hallucinations inhibit her.The book is fast paced and furious. The treatment of the genetics and the warfare in the future is brutally imagined and perfectly told.Not for the faint, Catherine's story is interesting and fresh take on war in the future. Reading T.C.’s Subterrene War Trilogy has been an interesting and memorable experience. The first book, Germline, blew me out of the water (my five star review). I’ve never read a book like that, and loved the personal connection I had to the main character’s journey. I loved that story and T.C.’s in-your-face-war style so much that I couldn’t enjoy any other books because they weren’t the next book in his series. (By the way, I talked with T.C. over at the SF Signal podcast #140, about his journey to publication and development of this series, so please go have a listen. )All that said, rating a book after feeling so strongly about the first book makes it almost unfair. After all, this is a different main character, and really the only difference as far as quality between the two books is that I connected more personally with the main character in Germline. Regardless, T.C. picks up right where left off in terms of complicated characters thrown into high-stakes warfare to give me the fix I needed after the emotional thrill ride of Germline. It was a tough act to follow, but he did a tremendous job without making it feel like a repetition of old tricks.Exogene‘s hero, Catherine, is a complex character, and I believe T.C. did a masterful job of weaving multiple issues into a fast-paced story. You get the futuristic technology involved in her being a genetically created assassin (awesome), but you also get insight into her philosophical questions. Catherine, a.k.a. Little Murderer, has been bred and brainwashed to hate the enemy she is ordered to kill, but when her and her lover escape, she encounters so many new perspectives, that the real enemy becomes muddled–including whether she is the real enemy. This girl is constantly questioning why she hates, her purpose in being alive if her natural drive is to kill, whether God exists and if he does whether he cares or is sovereign over her path, and ultimately how she can find peace within herself.T.C. paints a beautiful story that can be read over and over. His weaving of hallucination memories in with the present day action not only makes you fear for her losing it, but also provides a way at discovering the depth of her character in pictures of her struggles that link past to present, dropping clues as to what she is learning as T.C. repeats the theme of warriors desperately trying to escape war. The climax is very well done and surprising, once again making it hard to go on to read anything else but Book Three, Chimera. I expect this series to go down as one of my favorites. Exogene by T.C. McCarthyThis book is the life story of a military clone in a future war for natural resources. Cloning is here regardless of the ethics or morality surrounding its existence. A logical step forward is to assume that the military industrial complex is exploring how cloning can impact future wars and if cloned warriors are financially viable they will probably be produced. I realize that is somewhat cynical but cynicism is a root theme in the book. The use of religion to keep warrior clones focused is a re-visitation of the Manchurian Candidate. (The original version, I never saw the remake.) The genetics or clone warriors are supposed to be identity free, satisfied with numeric nomenclature and focused only on killing. Sadly the killing focus supported by religion seems congruent with the jihad motivation of the Islamic extremists or the 1950’s rallying cry of “kill a Commie for Christ”. The author clearly demonstrates the power of combining religion and warring into religious killing for the right to enter Nirvana. This is a war story based on the need for resources which is obviously motivated by the current debacles to maintain the flow of oil. As much as we would like to think that war is motivated by the desire to do the “right” thing, most often it is done to line the pockets of the perpetrators. The insights developed as the girls “spoiled” provides a somewhat depressing mental state as escape is pursued to ruined, radioactive terrain. This is a war story, fought with logical extensions of current technology and hopefully an illogical use of clone warriors (slaves). It was a thought provoking look at a possible future of war. Originally posted at my blog here.I probably wouldn’t have picked this up had I realized that this was a war novel. But am I glad I did. Yes, it is brutal, and sometimes pedantic in its descriptions, but the descriptions are detailed. The futuristic landscape, much of it irradiated seems to come to life in T. C. McCarthy’s words. There are a lot of details on war maneuvers, “plasma” weapons, “tracer flechettes”, APCs and grenade launchers.We hear of the story in the first person; Catherine is the narrator. And through her voice, and it is a voice filled with doubt, we glimpse humanity. For all her killer instinct and cold reasoning, Catherine is a heroine we can empathize with. Not having any sense of normalcy besides the normalcy of war, she still begins to doubt the “rightness” of unceasing war, weighing the “good” and the “evil” in her heavily indoctrinated and medicinally dosed mind.I thought McCarthy’s idea novel, and the book itself (which is the second of “The Subterrene War” series, I find out now) an ode to humanity’s incessant greed and corruption. While on the face of it, this is a war novel, this also probes beneath the surface to raise questions about the relative nature of right and wrong. Well-written, this is an engrossing, thought-provoking read. Recommended. Having really enjoyed the first novel of the trilogy - Germline, I have to say I was similarly impressed with Exogene. Germline for me was an excellent read and got 5 stars, Exogene told from the perspective of a germline soldier Catherine was again a book I rate very highly.Catherine's story goes from initial training, to war against the Russians, escape into the hands of the Russians and a momentous journey to Thailand.The surroundings are bleak & grim, the tech descriptions and violent battle scenes are excellent.Its not difficult to empathize with Catherine even though she is a genetic with a short live span and her story is disturbing, interesting and impossible to put down.She decides she does not want to die when her two year life span has expired and questions everything - her religion, the orders she receives and the expectations that she is to give up and die because her two years are up. She wants to escape the war and kills a lot of people in the process with little or no remorse.Looking forward to the third book in the series, Chimera, which is due out later this summer. I thought it was interesting, I thought it was interesting how it illuded to future wars, current conflicts, and the damage caused by mass nuclear strikes across Asia. Also referred to the beauty of nature if left to its own devices. I felt a little wanting at the end. That the main character allowed herself to be destroyed after 4 years, seemed quite pointless, and not as pious as the author tried to make out. Like that in accepting ones destiny we welcome our death. Really? Maybe its because she was a clone...I dont know. What the hell is a flechette anyway.Definitely had exciting action scenes in it. A different fiction altogether. Really fantastic world building and characters. The lack of the final star has to do with the ending and a certain death I don't think should have played out. Just my thoughts. I look forward to the next book! Exogene is a thoughtful and provoking story from the POV of a short lived cloned female soldier. It was a great read. I could hardly put it down. It was the captivating study of the morality of creating clones to fight a war and using religion to motivate them. I highly recommend this book. This was a great read. If future war is your thing, then you will love this series. T.C. McCarthy is quickly becoming one of my favorite sci-fi authors. I wanted to like this book more but Germline the first in the series really is the better book. The sequel focuses more on the genetically engineered super soldiers and their forays in the subterranean wars. The genetic soldiers are psychotic and have a shelf life which causes them to spoil. This novel focuses more on them, their upbringing training etc. I could care less about the main character, the novel meanders from one locale to the next and honestly didn't bring anything together. The religion used to indoctrinate the genetics is expounded on more but the whole moral/religious dilemma of the main character doesn't really pan out. My favorite parts of the book were learning about the new armor units and theChinese developing their own genetic technology but this is only touched upon. I'm starting on the last book of the trilogy and I hope the series can be redeemed. Religion, war and genetically engineered super-soldiers who are taught that killing is a divine wish make for a chilling, grim tale about war in a possible near future. The main character, Catherine, one of these super-soldiers, outlives her sell-by date, which is called "the spoiling". However, instead of rotting away, she lives through this period, which also involves a process of "mental cleansing", taking her through nightmares and hallucinations. She reflects regularly on her existence and its purpose and in the end she writes her own story, which is this novel. Worth a try. Read by Bahni Turpin for Blackstone Audio and released concurrently with the mass market and e-book from Orbit, Exogene sets up as a much more traditional military sf novel than did the author’s debut, 2011’s Germline. Germline was read by Donald Corren, and was a drug-addled war journalism narrative, glossing a bit over technical details whether of weaponry, mech suits (other than detailing a bit of the waste system), or of the eponymous genetic engineering.Here, Exogene shares only the setting — a near future war over mineral resources in Kazakhstan and its surrounds — and a first person perspective. The voice has changed, as has the narrator’s attention to technical detail. Turpin shows us the Subterene War from the point of view of Catherine, one of the genetically-engineered soldiers used by the United States and its allies. We find out some technical details of her flechette rifle such as its capacity, speed, and firepower. We find out more about the science and psychology and training behind the Germline project, and the lives, loves, and losses of women who were more shallowly perceived by the aforementioned drug-addled male journalist in the first book. This is not to say that there aren’t a few missteps: in the first quarter of the audiobook, some post-production artifacts remain from re-recordings for corrected pronunciations, though they aren’t too distracting. And for my money, though this was admittedly a review copy, some of the emotional impact of these losses don’t appear fully realized or felt. (Though, again, there are drugs and psychological conditioning at work.) But overall Turpin does a quite capable job here of bringing the “girls” (16-18 year olds) to a richer life, amidst a wider and richer cast of characters than inhabited the close quarters of Germline. Turpin’s turn at Russian (and other accents) are mostly well done, easily besting recent attempts from other non-native narrators (Malcolm Hillgartner’s forgettable tries at Russian, Hungarian, and Chinese accents in Neal Stephenson’s Reamde for example) though at times the closing words of sentences lose their flavor. It’s a good thing Turpin can handle her Russians, because we see quite a few of them, and hear a fair bit of Russian along the way towards discovering what it is the Russians are up to, exogentically. (If you’re guessing “exoskeleton”, you’re on the right track.) 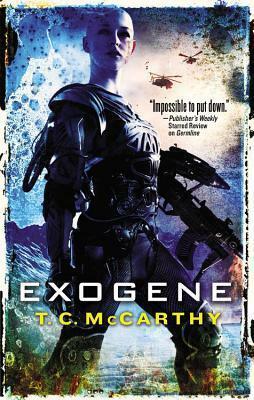 While Germline spent quite a bit of the capital of sf ideas for the world of the Subterrene War and had a more unique voice, Exogene sees McCarthy come a bit more into his powers of plot, and already leaves me wondering on where he’ll go with the trilogy’s conclusion, Chimera, due out in August. T.C. McCarthy’s gripping sequel to Germline tells the story of the futuristic subterrene war from the point of view of Catherine. Catherine is one of the genetically engineered American soldiers, a killing machine housed in the body of a teenage girl.The story is slightly less intense than the first (though there’s no shortage of action) but is, in my opinion, more thought-provoking.In the midst of the war, Catherine is forced to find her place in a world where she is no longer allowed to act in the capacity for which she was created. I found her perspective fascinating. Her reactions, as well as the evolution of her psychological development, remained true to both her original nature as well as the understanding she’d come to in that moment of the story, which is an impressive feat. Catherine’s struggle is applicable to past and current soldiers who believe they are fighting for a holy cause. It helps me see the actions of others from a different perspective, which is always a good thing.I would recommend this to fans of gritty (meaning seriously dystopian) science fiction. I thought this was the best book out of the three in the series. Basically, you're following one of the psychotic genetically bred super soldiers as she approaches her own death. I liked how you got in her mind and saw her perspective and priorities. Her thoughts about the children she cannot have. Her sisters in war. And those who are not really her allies even though they made her to fight for them. It was also infuriating to see how they were treated by the non-super soldiers. I think that's what made this one grittier to me. Like seeing how she lived and was treated rubbed my nose quite thoroughly into the dirt that was going on.Still a three as the other books are, but this was a high three and the others a low three. 2.5 starsYou wouldn't think that an allegorical critique of America's foreign and military policy featuring a bisexual genetically engineered cloned super-soldier nicknamed "Little murderer" could be boring. Think again.For a combination of reasons, this doesn't flow nearly as well as *Germline*. The experiences of the protagonist were not very interesting. Her emotional and mental arc is either deliberately opaque or poorly written, which made it almost impossible for me to connect with her. The action is not engaging. When I read *Germline*, I couldn't put it down. With *Exogene*, I couldn't pick it up. T.C. McCarthy - T.C. McCarthy is an award winning southern author whose short fiction has appeared in Per Contra: The International Journal of the Arts, Literature and Ideas, in Story Quarterly and in Nature. His debut novel, Germline, and its sequel, Exogene are available worldwide and the final book of the trilogy, Chimera, will be released in August 2012. In addition to being an author, T.C. is a PhD scientist, a Fulbright Fellow, and a former Howard Hughes Biomedical Research Scholar.